An iconic and beloved member of Yellowstone National Park's most famous wolf pack was just shot dead by a trophy hunter — and it was totally legal. "We are heartbroken to share the news that the wolf killed outside the park was 926F of the Lamar Canyon Pack," wolf advocacy organization Wolves of the Rockies wrote on Wednesday. The organization confirmed the news with the park. Spitfire's mother, 06F, was also killed by a hunter back in 2012. Wolves of the Rockies credits Spitfire with helping to keep the pack together after her mother's death. "Once wolves step outside park boundaries they have zero protection," Brooks Fahy, executive director of Predator Defense — an organization that seeks to protect native predators from a multitude of threats, including those from trophy hunters as well as state wildlife agencies seeking to control wolf populations — told The Dodo. "This tragedy should be one more wake-up call." Wolves are a keystone species — an essential part of the ecosystem — and when their packs are decimated, this can have a resounding impact on other species. "The importance of a keystone predator such as the wolf to a balanced and resilient ecosystem is undeniable," the Wolf Conservation Center (WCC) explained. The presence of these iconic wolves also impacts human communities, too. The Lamar Canyon Pack draws many visitors to Yellowstone each year, helping to support the preservation of one of the country's most unique natural treasures. "Studies also show that since their return over 20 years ago, wolves have delivered an economic boost to Yellowstone’s surrounding communities," WCC wrote. "University of Montana researchers found that wolves bring an estimated $35M in annual tourist revenue to the region." Elizabeth Claire Alberts, a fellow staff writer at The Dodo, remembers what it was like to see this pack back in September 2017 on her visit to Yellowstone, when she came across a group of wildlife enthusiasts who were spending all summer watching the wolves through binoculars. "We watched them roll around in the grass and then travel through the valley as a family. We even heard them howl to each other," she said. "I think we watched them for over an hour. I wasn't even aware that time was moving. I was captivated." 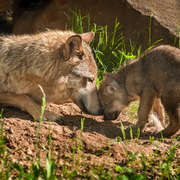 Maggie Howell, executive director of WCC, pointed out that when wolves are given wider protections around other parks it can be greatly beneficial to the whole ecosystem. In Algonquin Provincial Park, in Ontario, Canada, for example, where wolves have been protected for more than a century, hunting in the surrounding areas outside the park was killing off over half of the wolves who lived in the park. "[Wolves were killed] primarily in winter when their main prey, white-tailed deer, roamed outside the park in search of forage," Howell told The Dodo. "But in 2001, when hunting on the outskirts of the park was banned, an amazing transition began to unfold. Protected from hunting, not only did the Algonquin wolf population hold steady, there was also a rapid transition to more stable, family-based packs ... With added protections, eastern wolves reclaimed their place as a keystone species within the ecosystem." If similar protections can be adopted for the Yellowstone wolves, Spitfire will not have died in vain. You can help protect wolves by making a donation to advocacy organizations like Wolves of the Rockies, Wolf Conservation Center and Predator Defense.